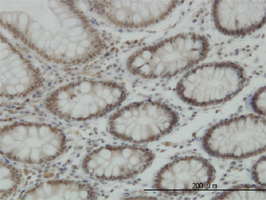 Mouse anti Human JARID1B antibody, clone 1G10 recognizes human Lysine-specific demethylase 5B, also known as JARID1B, Cancer/testis antigen 31, Histone demethylase JARID1B, PLU-1, Retinoblastoma-binding protein 2 homolog 1 or Jumonji/ARID domain-containing protein 1B. JARID1B is a 1544 amino acid ~180 kDa ubiquitously expressed histone demethylase. Xiang, Y. et al. (2007) JARID1B is a histone H3 lysine 4 demethylase up-regulated in prostate cancer. Proc Natl Acad Sci U S A. 104: 19226-31.